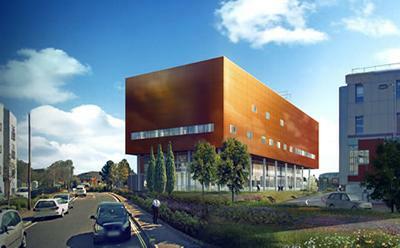 Architect’s impression of the new Centre for Cancer Immunology. The University of Southampton’s planning application to build the Centre for Cancer Immunology has been approved by Southampton City Council. The Centre will be based at Southampton General Hospital and bring together world leading cancer scientists to expand interdisciplinary research teams, increase the number of clinical trials and develop lifesaving drugs. The Centre will be the first of its kind in the UK and boast state-of-the-art laboratories, patient facilities and office space. The new Centre will be built opposite the hospital’s main entrance, next to the Somers Building, replacing the disabled car parking spaces. These spaces are being relocated throughout the hospital site at access points including the main entrance (with spaces on the ground floor of the main car park), the eye unit, the neurological centre, the west wing entrance and Taplins nursery. Additional standard parking spaces, sufficient to cover the spaces taken over by the disabled spaces, will be made available in the new multi-storey car park, in Coxford Road. The University of Southampton launched a campaign last year to raise £25 million to fund the new Centre and is has reached 75 per cent of the target. One such donor is Matthew Hodgson of Warwick Capital Partners LLP. “The creation of a world-leading Centre will not only reinforce collaboration and exchange of ideas but it will also attract the greatest minds in the field,” he said. Professor Elliott said: “The University has a long-standing track in innovative immunology research with a strong and successful ‘bench to bedside’ approach. This new Centre will enhance our expertise and expand the research teams in Southampton to make even greater progress in developing new treatments. The next few years will see great advances in immune therapies for cancer with the University of Southampton at the very forefront of discovery." More information about the University’s campaign for the new Centre can be found at www.southampton.ac.uk/youreit along with more information about the plans for the new building.